A Series Electric Screens 100" Diag. Features an arcuate profile casing that easily installs to your wall or ceiling with the included mounting kit. HD Matte white fabric with wide viewing angle, Fully black backed front projection screen with textured surface. Mildew resistant and easy to clean with mild soap and water. Includes infrared (IR) and radio frequency (RF) remotes, detachable 3-way wall switch, and 12V trigger cable. The powerful yet silent built-in synchronous motor, scroll up and down by remote control while remaining power efficient. With all mounting hardware included for easy wall or ceiling installations. Also includes flush wall mounts that allow screen to slide horizontally. 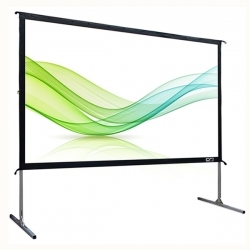 The A series is an electric projector screens that embodies all the virtues of quality, durability, and aesthetic value. 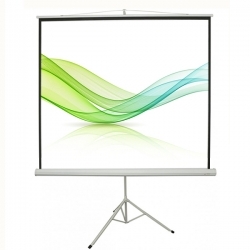 Electric Projector Screen Auto Remote Projector Motorized Projection Screen 80" x 80"